Prologue: Madang Province is one of the northern coastal provinces of PNG, and one of the more attractive and verdant parts of the country. I first came here in 1990 when I was based at the, now closed, Christensen Research Institute (CRI) on the northern coast road about 14mls north of Madang town. I was working with Oxford University’s Department of Clinical Medicine, as the herpetologist with the otherwise medical team and had come to Madang to capture the elusive but highly venomous New Guinea small-eyed snake, Micropechis ihaheka, for venom and snakebite research. Locals call this much feared snake, which can achieve lengths of over 2.0m, the wait snek (white snake) because of its light coloured body colour which contrasts with its dark head and the red-brown body rings. Madang Province is one of the northern coastal provinces of PNG, and one of the more attractive and verdant parts of the country. I first came here in 1990 when I was based at the, now closed, Christensen Research Institute (CRI) on the northern coast road about 14mls north of Madang town. I was working with Oxford University’s Department of Clinical Medicine, as the herpetologist with the otherwise medical team and had come to Madang to capture the elusive but highly venomous New Guinea small-eyed snake, Micropechis ihaheka, for venom and snakebite research. Locals call this much feared snake, which can achieve lengths of over 2.0m, the wait snek (white snake) because of its light coloured body colour which contrasts with its dark head and the red-brown body rings. 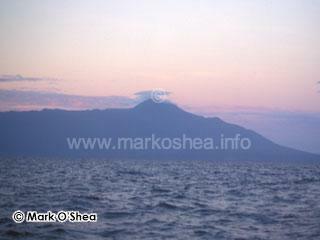 Karkar Island is a volcanic island off the Madang coast. Mt Uluman erupted in 1974, 1979 and is threatening again. 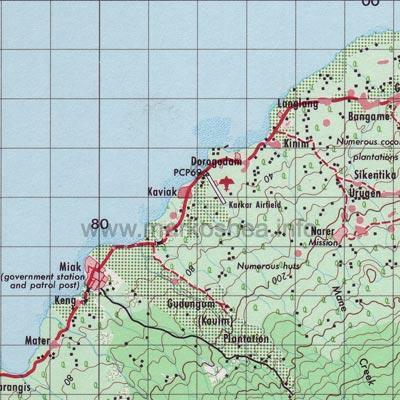 Kinim airstrip is in the northwest of Karkar (see red airport symbol) and Kaviak plantation, where we are usually based, is to the southwest, in from the 80 numerals, near Miak, not Kaviak as on the map. 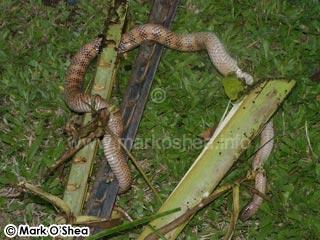 It was back then that I discovered these snakes were plentiful on Karkar Island, a volcanic island 40kms northeast of Madang. Starting in 1990 I have made numerous trips to the island to capture over 40 small-eyed snakes for venom research, including filming an episode of O’Shea’s Big Adventure there. My AVRU (i) colleague David Williams has also visited Karkar numerous times since the mid-1990s so we are both well known on the island. But that was then, and this is now. David, his Papuan field assistant Jasper Gabagabu and I were planning another trip, about a week after our return from Western Province and Daru Island. That was not all we had to do in Port Moresby. We had been asked to give presentations on PNG snakes and snakebite to representatives of the UN and WHO in Port Moresby. My talk was on the identification, distribution and natural history of New Guinea snakes, with particular emphasis on the medically important species, David’s on snakebite epidemiology, first aid treatment, emergency room management and the antivenom crisis. Both presentations were in Powerpoint and 40-50 minutes in length. They were delivered to three very responsive audiences of professionals, first my talk, then David’s, then mine again, leap-frogging, a virtual non-stop marathon. On the Monday we flew to Madang. It was our intention to arrive in Madang and immediately board a small Mission Aviation Fellowship (MAF) aircraft for the half-hour flight out to Karkar Island but Air Niugini left all the luggage behind. Although it all arrived on the late afternoon flight it was too late to fly to Karkar so we had to postpone until the following day. The upside was that it gave us the chance to have dinner with Peter Barter, the recently retired PNG Minister of Health, owner of the Madang Resort where we were staying overnight, and a staunch supporter of the snakebite research. The next day we boarded the little MAF aircraft and flew to Karkar, which measures about 21km north-to-south and 17km east-to-west, with a surface area of some 362sqkms. 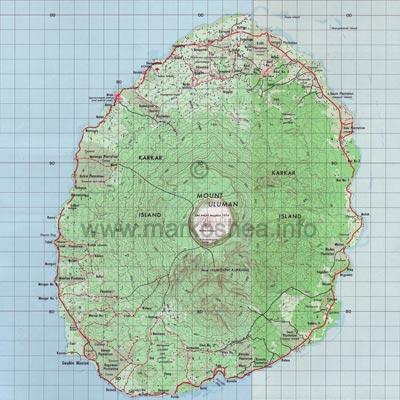 It is part of a string of volcanic islands along the Madang coast, one of which, Manam, has been erupting recently. Karkar erupted in 1974, and then again in 1979 when it killed the two vulcanologists who were observing it. It is the general opinion that the volcano is due to erupt again. Black volcanic soil is extremely fertile so the lower slopes Karkar’s central Mt Uluman are clothed with coconut plantations. 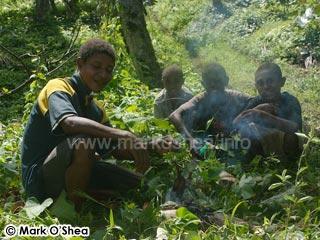 The island supports a population of 45,000 – one of the most populated non-urban locations in PNG. The MAF pilot agreed to fly us over the volcano itself provided the winds were not dangerous. 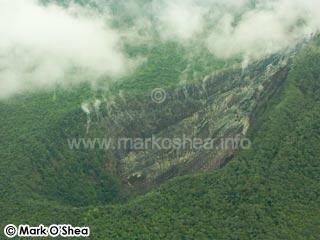 This enabled David and myself to photograph the inner crater. As we looped around the crater we could see huge single-drop waterfalls, the steep crater rims, rows of incinerated trees, and great spouts of steam issuing out of the forest itself, yes Karkar looked ready to go again. Jasper was less impressed and said he would have hid on the floor if he could have unbuckled his seatbelt. We flew on and landed at Kinim airstrip and were driven to the familiar guest house by Brett Middleton, a third generation Karkar planter whose roots on the island extend back to 1919. (i) AVRU = Australian Venom Research Unit, part of the Dept. of Pharmacology, University of Melbourne. 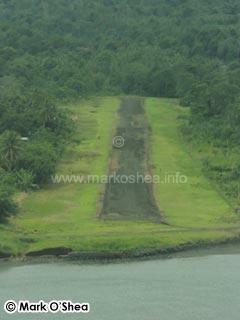 The runway at Kinim, Karkar Island. 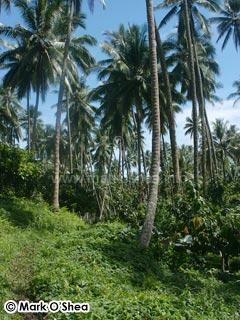 Karkar Island coconut plantation habitat. The fieldwork period was from 6-12 May 2008 but we had already lost one day due to the airline. Settling in and letting the word go out that “tupela snekmen emi kam long Karkar” we planned our first snake catching trip for the morrow. Our first field day was very successful. The small-eyed snakes are nocturnal and they shelter during the day in the large piles of discarded coconut husks that are scattered throughout the plantations. These huskpiles go through a transformation not unlike that of a new house, from fresh and sterile, from comfortable and homely, to broken down and inhospitable (except for aggressive ants), though fortunately houses take longer to run the full cycle. This entire degradation is caused by termites, the builders and breakers of the tropics, accompanied by millipeds. 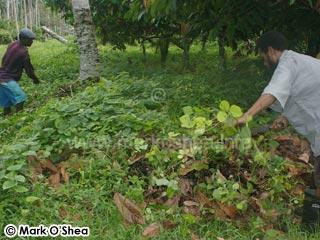 We were looking for large huskpiles in the middle-age range with some shade from cocoa trees and coconut palms. Our search method involves clearing all the green vegetation which clothes the huskpile, mostly the fast-growing kudzu vine Pueraria introduced by Brett’s grandfather, and then clearing the surrounding debris down to ground level all around the huskpile so the snakes cannot escape without crossing open ground and being observed. We then settle down to disassemble the huskpile bit by bit, catching any reptiles we encounter for later identification, photography and documentation. Hopefully there will be a small-eyed snake in the pile but generally they make their way to the bottom and are only caught in the final moments. 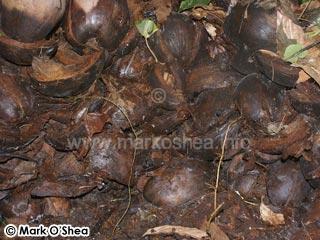 The interior of a coconut huskpile, home of the New Guinea small-eyed snake and many other reptiles. Often the boys working with us would flush out a rat, which they would chase, kill, and cook on the spot – Mmmmmmm, tasty!!! 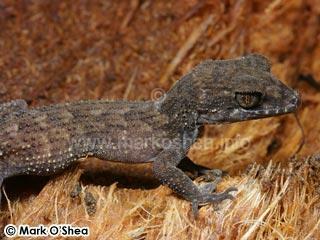 Other reptiles we encounter include the Pelagic gecko, Nactus cf. pelagicus, the commonest lizard in the huskpiles; the outrageous Crocodile skink or 'puk puk palai', Tribolonotus gracilis, the most unskink-like skink imaginable with the head of a baby dinosaur, four rows of rose-thorn-like spines down its back, and orange war-paint around its eyes. This unusual skink is one of few non-gecko lizards able to vocalise so you often hear them before you see them as they emit a loud shriek of protest at being disturbed. 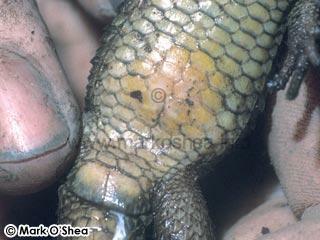 They also bear strange glands of unknown purpose on the abdomen, palms and soles of their feet, and their reproduction is quite odd too, females only possessing one oviduct but two ovaries, so one of the huge eggs has to migrate across the body cavity in order to be laid. 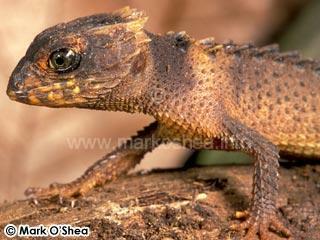 I have been observing and obtaining data from these lizards on Karkar for many years and have documented over 150. We also have a small group of crocodile skinks off-show at West Midland Safari Park (www.wmsp.co.uk) which came to us as a UK Customs and Excise confiscation, so we also now have the chance to observe and study them in captivity. 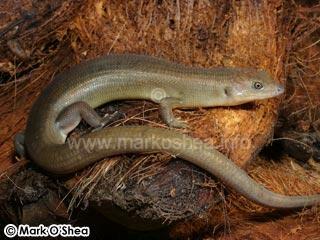 the commonest lizard in the coconut husk piles. with unique abdominal gland of unknown purpose. with single large, striated egg. 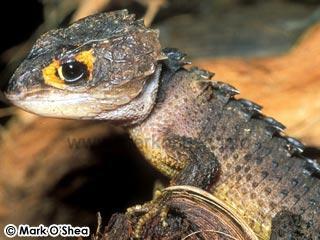 with characteristic angular head, keeled dorsal scales and orange war-paint around the eye. 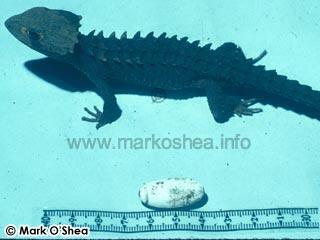 Newly hatched Crocodile skink, Tribolonotus gracilis. 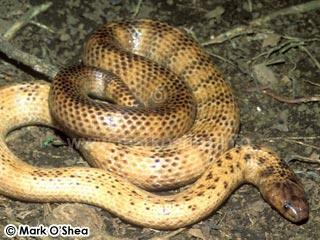 A number of snakes also inhabit the huskpiles, from Ground snakes, Stegonotus parvus, and Brown treesnakes, Boiga irregularis, to the New Guinea ground boa, Candoia aspera, but on this occasion our first snake, in the first huskpile, was what we were after – a New Guinea small-eyed snake, M.ikaheka. Right at the bottom we uncovered a large (1.0m+) specimen which reacted instantly to being uncovered by trying to escape, but it was too late, three snake catchers were onto it, David, Jasper and myself, and it was soon safely in the Probagger (www.tongs.com) a system which, combined with M1 tongs from the same US company, removes the need to physically touch highly venomous snakes and risk a bite whilst catching them in remote locations. 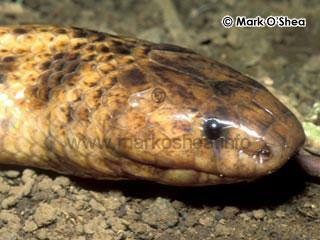 a common snake in Karkar huskpiles. Our second huskpile did not yield any snakes but our third was another successful selection from the hundreds that dot this plantation, and thousands that may be found throughout the entire island. Also with us was Jen Laning, an Australian nurse, who was staying with the Middleton’s during her tour of PNG health centres. She tagged along with the snake hunting team and before long could not resist joining in with the mucky business of huskpile disassembly. Near the bottom of the third huskpile she was working on my left, “Should we go any deeper?” she asked. “Yes” said I, and the very next moment Jen simultaneously screamed and shot backwards as our second small-eyed snake, slightly larger than the first, appeared underneath her. This specimen too followed its fellow into a separate Probag. We now had one female and one male and felt justified in returning to base for hot showers and cold beers. Our second day produced two more small-eyed snakes but we also had several small-eyed snakes brought in my locals despite our pleas for people not to do this. In the space of 20minutes three small-eyed snakes came in, one in a sack, one rather professionally caught by an old fellow with a fishing line noose on a stick, and one trussed and trapped in a palm frond. We did not expect this last specimen to survive but at the time of writing it is still alive. David and I strongly discourage people from capturing dangerous snakes for us, it is simply too dangerous for inexperienced and ill-equiped locals to try and capture highly venomous snakes alive. 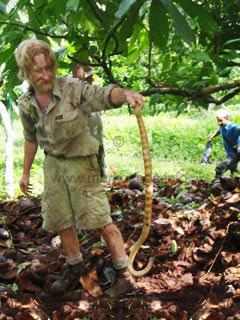 Also, snakes captured by villagers are often injured and die soon after capture. They also lack important data relating to time of activity, microhabitat etc. We do encourage people to let us know when they see a venomous snake, telling them we will come over directly to capture it. trussed and pinned between palm fronds. Snakes do not usually survive this treatment. 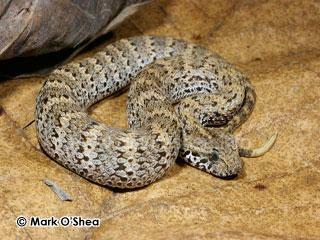 The other species we needed was the Smooth-scaled death adder, Acanthopis laevis. Although this is most widespread death adder in New Guinea (ii) we are anxious to obtain specimens from different localities for venom and DNA samples, and luck was with us when Jasper managed to obtain a small specimen on our final field day. We had hoped to respond to calls about several death adders in the neighbouring village and gardens but heavy rain meant people were not working in their gardens and the snakes were hidden from view. The suffix (I) indicates inside huskpiles, (O) indicates on top of huskpiles. (ii) Death adders are not actually adders (vipers), they belong to the same family as all the other venomous snakes of Australia and New Guinea. However, as vipers never not managed to reach this region there is a niche for a short, stumpy, nocturnal sit-and-wait ambusher with vertically elliptical pupils and a tail designed for caudal luring of prey. 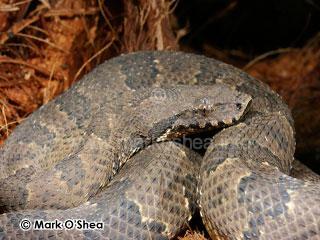 The death adder is a member of the Elapidae that evolved to occupy this niche, occupied in the rest of the world by the vipers and small rattlesnakes. This is called convergent or parallel evolution. The “death” part may also not be as ominous as it sounds. Although this snakes can and do cause human fatalities, it is thought the word death is a derivation from deaf. Because early Australian colonists discovered these snakes did not run away, like most other species, they reasoned they must be deaf, but of course all snakes lack ears. (iii) The actual list of reptiles and amphibians recorded from Karkar Island is longer and I add species on a regular basis, including a 3.0m Papuan olive python, Apodora papuana, in 2006, but this list is limited to species recorded during the 2008 visit. 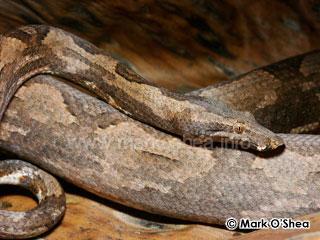 is the Smooth-scaled death adder, Acanthophis laevis. On the Monday we left Karkar on the MAF charter, heading back to Madang for an onward flight to Port Moresby where David and I have only one day to reorganise before we depart for Southern Highlands Province to conduct the initial searches for a survey of a rare montane python. Karkar may have been a tropical island but where we are going next requires cold weather clothing too.